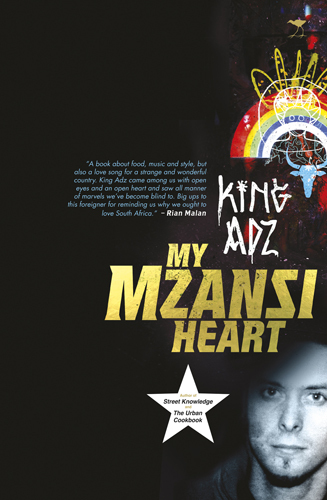 Reading King Adz’s My Mzansi Heart is like watching a reality TV show: drama, drugs, rock and roll, and rather longish ad breaks in-between. The book was almost too much for my senses and left me quite confused at times. I doubt, however, that nearing forty, still wearing shoes I bought a decade ago, and attending Metropolitan Opera live transmissions at Cinema Nouveau, I form part of the readership My Mzansi Heart is targeted at. Yet, King Adz and I have something crucial in common. We are both foreigners who have made our homes in South Africa, having fallen head over heels in love with the country and its people. Every love is different though. What matters is that your heart is in the right place, and King Adz’s beats for Mzansi. King Adz is the pen name of Adam Stone, a Brit who grew up in the outer suburbs of London, arrived here with his family just after the changeover, and decided to stay. He started off at an ad agency and became a filmmaker, a writer (previously of Street Knowledge, The Urban Cookbook, The Stuff You Can’t Bottle: Advertising for the Global Youth Market), and most importantly a promoter of everything connected with street culture. Somewhere along his many travels he took the wrong turn and nearly lost everything to booze and drugs. My Mzansi Heart tells the story of his descent into the hell of addiction and his recovery. The in-your-face narrative, punctuated by slang and a lot of French, is a rollercoaster ride across South Africa. It includes King Adz’s encounters with some famous locals such as the photographer Roger Ballen, the fashion stylist Bee Diamondhead, or writer Rian Malan. Along the way he also sniffs out potential future stars of different industries, whether it is fashion, media, photography, food, or music. King Adz roams the cities from Soweto to the Cape Flats looking for talent and promoting his heart out for places, institutions, products, and people (himself included), he believes in. Towards the end of the book he writes: “There was a second there, typing the above words in, that I stopped and thought of the enormity, the stupidity, and the restlessness of the egocentric and Warholian act of self-promotion, and how it consumes a lot of my life. One moment it seems worthwhile, the next pointless and empty.” The statement captures my sentiments about his project. My Mzansi Heart offers many great flashes of insight into present-day South Africa, but one has to wade through a lot of fluff and bling to get to the gritty, good stuff. Perhaps surprisingly, though, King Adz selling techniques worked on me. I’m looking forward to taking out a friend to lunch at Beijing Opera. As a lover of dim sum, I was intrigued by the mention of the “pop-up” restaurant in My Mzansi Heart (King Adz knows the owner Yang, and they have a copy of his cookbook on the wall). And I am not ashamed to admit that I’ll be looking out for Jack Parow Braai Sauce at my local supermarket. First published in the Cape Times, 26 September 2014, p. 31. This entry was posted in What I've Read, What I've Written and tagged ad agency, ad breaks, Adam Stone, addiction, at home in South Africa, Bee Diamondhead, Beijing Opera, book, booze, Brit, Cape Flats, Cape Times, changeover, Cinema Nouveau, cities, cookbook, dim sum, drama, drugs, fashion, fashion stylist, filmmaker, food, foreigner, French, future stars, industries, Jack Parow Braai Sauce, Karina M. Szczurek, Karina Magdalena Szczurek, Karina Szczurek, King Adz, live transmissions, London, media, Metropolitan Opera, music, My Mzansi Heart, narrative, non-fiction, pen name, photographer, photography, potential, promoter, reality, recovery, review, Rian Malan, rock and roll, Roger Ballen, slang, South Africa, Soweto, street culture, Street Knowledge, talent, The Stuff You Can’t Bottle: Advertising for the Global Youth Market, The Urban Cookbook, travels, TV show, writer on September 30, 2014 by Karina.